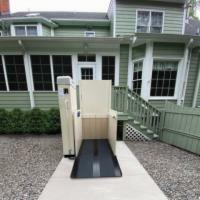 The AmeriGlide Hercules II 600 Residential Vertical Platform Lift is a porch lift that is designed for residential use. Supporting up to 600 pounds, this wheelchair lift needs only some assembly, so it can be set up quickly and easily. A sturdy solid metal platform, safety pan, and Acme screw drive are just some of the many features that are designed to increase safety.